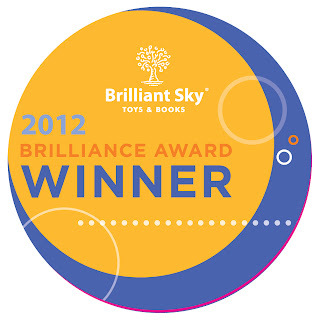 I just have to tell you about Brilliant Sky Toys and Books! This is one of those old time type businesses, where the customer is important. You can talk to real people not just a computer that puts you on hold forever. Before I go on I will tell you we were hoping to visit one of their stores while on our trip to Texas, but with some of the problems we had, we never made it. I would have LOVED to visit their actual store. Perhaps on our trip to Chicago soon, I will get another chance. The toys and games are all chosen with care. Brilliant Sky doesn't just want you to buy from them, they want you to leave delighted in what you have purchased. For those who do not live close enough to actually visit one of their 15 stores, you can visit them online to shop. Number 16 is opening soon in Houston, Texas. Be sure to stop in and just peruse the selection of toys they have. I was impressed with the quality toys available. And Brilliant Sky has coined it's own Award system whereby they recognize outstanding toys. This year seven distinct toys made their list. The toys are for ages toddler to tween, not to mention adults enjoying at least one of them. These toys start at $16.99 and go up. You can purchase the Boogie Board for $39.99. it is designed for ages 8+. My daughter enjoys this board where you can design, write notes, and draw, over and over again. Another great feature of ordering online is, you get free gift wrapping on every purchase. Once again the goal of Brilliant Sky is to delight the customer. I know that I consider that a benefit when ordering online. Need another step to make shopping a pleasure? Would you believe there's an app for that? Try their iPhone app at http://itunes.apple.com/us/app/brilliant-sky/id418102183?mt=8. Now, this is just the type of shop I am always looking for. One where the customer is first. They go the extra mile for you. When you walk into Brilliant Sky you are greeted by a smiling face and you don't have to search for someone to assist you. Customer service is very important to me when choosing where to shop. So be sure to take a minute and if you live close enough, visit one of the Brilliant Sky stores. If not, stop by their online store and look around. Be sure to "like" their Facebook page to stay on top of what is happening at Brilliant Sky. Disclosure:I received no monetary compensation for this post. I did receive a Boogie Board for review purposes. All quotes in red are taken from the sponsor's website or email. All thoughts and opinions are mine.